Note: For religious Jews, September 29 of the year 2011 is the Old Testament Feast of Rosh Hashanah. It begins at sunset on the 28th and ends at nightfall on the 30th. Since this is a holiday that God ordained, I thought we at least ought to know a little bit about it and what the purpose of the feast was. The Feast of Rosh Hashanah is the Jewish New Year. “Rosh” means head and “Hashanah” means year, so it is the Head or top or beginning of the New Year. It is observed on the first two days of the Jewish month of Tishri, the 7th month of the Jewish Calendar. 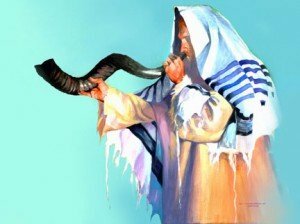 It is described in the Torah as the day for the sounding of the Shofar. The day is more commonly know as the Feast of the Trumpets or the Day of the Sounding of the Trumpets. Rosh Hashanah marks the start of the New Year in the Hebrew calendar and is when contracts and other legal documents start over. It also marks the day the Jews believe that God began his creation of the universe. So, it is a very important and serious holiday for the Jewish believer. It is totally unlike the American New Year celebration in that it is a very sober and serious occasion. How do you observe Rosh Hashanah? The Day of Rosh Hashanah begins a ten day period called the High Holy Days or the Days of Awe. The first day is the Day of Judgment or the Day of Remembrance. The ten day period ends with the most important day of the feast, “Yom Kippur” or the Day of Atonement. This was the day, in Bible times, when the scapegoat would be let out to send the people’s sins away from the camp. There are three themes that are emphasized for the ten day period – repentance, admitting, and returning. This process of repentance is called “teshuvah”. It is a time for reflection and introspection and looking back at the mistakes of the past year. You ask God to forgive you and make plans to change your life for the new year. People are encouraged to make amends with anyone they have wronged or have differences with and to make plans to improve during the coming year. It is a time to make peace in the community and strive to be a better person. At the synagogue, the shofar (ram’s horn) is blown one hundred times throughout each day in varied notes, calling people to repentance and to remind God of his covenant relationship with his people. No work is permitted during the entire two day holiday. Religious Jews spend most of the day in the synagogue, listening to the special liturgy that accompanies the festival. These were days that were important to God and his chosen people because He had them written down way back during the time of Moses. These feasts are still being faithfully followed by religious Jews over three thousand years later. On the day that Jewish people begin to ask God to forgive them and bless them for another year, perhaps it would be wise for us to pause and also ask God for his forgiveness and blessings for our nation and for each of us individually. “Several years ago, I heard a story about a Scotsman who was coming to America. He had purchased passage on one of the great ocean liners. He did not have much money, so he decided to save on food by stocking up on crackers, cheese, and fruit before he left. The ship sailed, and he began to eat his spartan meals. This went fairly well for the first four or five days. But as the ship drew closer to New York the crackers got stale, the cheese became moldy, and the fruit spoiled. Finally there was nothing left that was fit to eat. The Scotsman decided that he would go to the dining room and have one good meal before the ship docked and he went ashore. Isn’t this often true of the poverty of life in which we live by not realizing that Jesus has already paid with His life for blessings to us beyond our ability to count? “Like an ignorant child who wants to go on making mud pies in a slum because he cannot imagine what is meant by the offer of a holiday at the sea” (C.S. Lewis). I pray that we will all join each other today and this week at the banquet table of blessings He has prepared for us. To conclude our study of the stories found in Luke 15 we must now go back to the beginning and summarize what we have learned. As was stated in our introduction, for hundreds of years the Latin tradition has called this parable, “Evangelium in Evangelio“ (the gospel within the gospel) and we have learned that the tradition is wonderfully accurate. But to discover that truth we had to do a lot of digging and searching similar to what archaeologists would have done as they dug through one of the ancient tels. We explored each part of the parable in detail and by doing that we solved some problems that just a casual reading would present. We broke the parable into four segments, ”The Request for the Inheritance”, “The Far Country”, “Return Home”, and the “Banquet and the Older Son”, and looked at each segment carefully. This let us dig up some wonderful new avenues and thoughts that we had probably never noticed before with just a normal reading. Let’s summarize each section and attempt to tie it all together. When his son arrives in the far country, he quickly loses all his inheritance by making poor decisions. He has to go to work for a Gentile feeding his pigs just to survive. The story is telling us in an obvious Jewish manner that he has gone as far away from his family and God as he can possibly get. He realized that his only hope of survival was to get back to his father, so he came up with a plan to try to get back into his good graces. If he can just come up with the right words, maybe his father will take him back. He was trying to keep the law by working his way back to salvation into the good graces of his father and the family. The turning point in the story comes when the son appears at the edge of his village. His father has been waiting for him all this time to come home. He has been watching day and night. He runs out to meet his wayward child at the edge of the village and falls on his neck and begins to kiss his lost son. He didn’t wait to see what the son had to say for himself. He freely offered his grace first. The father’s grace was sufficient to redeem the son from his lost condition. No payment was required from the son! The father then orders a huge banquet to celebrate the fact that his son was lost and now is found. The banquet was like the Lord’s Supper in that as sinners we are invited to have fellowship with the Father, who demonstrated such costly love to save us. The older son, who is a law-keeper, is mad because he thinks there should be some compensation from the law-breaking younger son. He didn’t have to pay a price for his sins! Grace was offered without the requirements of the law being met. In fact, at the end of the story, grace was offered to both sons, the law-breaker and the law-keeper. What a picture of the gospel message! Now, you begin to clearly see who the characters in the story represent. Don’t forget who Jesus was speaking to (the Pharisees and the teachers of the law) and why He offered this story. He was responding to their complaints that He was receiving sinners and even eating with them! By telling a story of a father who orders a banquet so that he can sit down and eat with sinners (prodigal), He was obviously talking about Himself as the father figure. The younger son is definitely a metaphor for the tax collectors and sinners (the law breakers) that Jesus was associating with. The older son is definitely meant to be the Pharisees and the teachers of the law because they were the law-keepers. 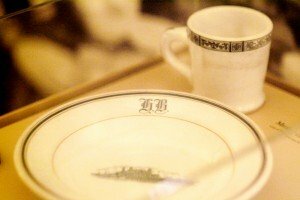 How could Jesus offer the law-breakers a seat at the table with Him? Jesus, as the father, then offers a seat at the table for the law-keeper (older son) also. Don’t we now have a much clearer picture of what the gospel really is? God is not some grim authoritative patriarch, but a loving father who will do anything to bring us back to Him. We can’t earn our way back; He has paid it all and at a great personal cost! He is constantly looking, taking on the role of a servant, waiting to run to us and freely offer His grace to us. When we accept His grace He then sits down at the table and eats with us to seal that reconciliation. The question remains at the end of the story – will we accept being found? Will we respond to that costly love? Will we sit down at the table of fellowship with Christ? The answer hangs in the balance as the reader has to respond to the invitation in their own heart. “Evangelium in Evangelio” rings loud and clear. This really is the gospel message and it is wonderfully portrayed in this story from the master story teller Himself, our Lord Jesus Christ. 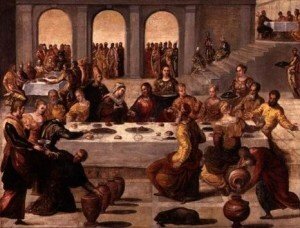 After the father meets and reconciles with his lost son, he orders a banquet to be held. He says in Luke 15:24, “Lets have a feast and celebrate, for this son of mine was dead and is alive again, he was lost and is found”. In the father’s perception, his son was lost and dead at the edge of the village and he went out in a costly demonstration of love to find and save his son. This brings up an important question. Was the banquet held in honor of the prodigal or in honor of the father? We usually think that the banquet is to honor the son. However, is it a celebration of the prodigals successful efforts at reaching home on his own, or is it a celebration of the success of the father’s costly efforts to find and save his lost son? If you compare this celebration to the most important banquet in the gospels, the Last Supper, you see some amazing similarities and truths of the gospel message. A part of the meaning of the Last Supper meal is that we as redeemed sinners are offered continued table fellowship with Jesus. The Last Supper is a celebration of Jesus’ costly sacrifice to reconcile us to himself. Isn’t this banquet that the father gives for his son a foreshadowing of the Holy Communion, where we are invited as sinners to participate in that sacred meal? Jesus is obviously the hero of the Last Supper Banquet and the sinners are not the center of attention. All glory is reserved for the father. Jesus does not eat with sinners to celebrate their sin, but to celebrate his grace. This banquet, ordered by the father, is a celebration of the costly efforts and great sacrifice the father has made and sinners (the lost son and the older son) are invited to come. The older son has a real problem with the idea of grace being given to the younger brother. He doesn’t think that there should be any reconciliation without compensation. Why didn’t he have to pay back all the money he lost before the father took him back? He wasn’t having to pay for his sins! Grace was offered and accepted without the requirements of the law having been met. Grace is not only amazing, but unbelievable! How can it be true? Don’t we get what we pay for? The older son refuses to participate in the celebration and attacks both his father and brother in public. In doing so, he insults his father in front of all the guests. A western cultural equivalent would be to have a shouting match with your father at a wedding. Now, the older son has also severed his relationship with the father. What will the father do? Culture would expect that the father would explode and reprimand the older son for the dishonor that he has caused. However, again the father is willing to offer a costly demonstration of his unearned love. Only now it is offered to the law keeper instead of the law breaker! He leaves the banquet and entreats the older son and offers him the same costly undeserved love. The parable has no ending in that we don’t know what the older son decides. Will the older son now enter the banquet and start acting like his father or will he refuse to accept his father’s offer of costly, unearned love? The reader is invited to provide the ending. In our final segment we will try to summarize what we have learned and look at the theological themes that are present in this unbelievably complex and fascinating story. The turning point in the story comes when the son decides to return home and appears at the edge of the village. He has worked on his speech and is bracing himself for the humiliation he will face when he tries to return to the family. He knows that the “Kezazah” ceremony is coming. He is empty handed and has insulted his family and is a failure in every respect. But what about the father? He also knew that his son would fail and he also knows how the village will treat his son when he comes home. But, the father is so full of love for his lost son that he has already thought of a plan to save him. Day after day he waits expectantly, looking down the road that leads to the edge of the village. When he sees his son coming, he will run out to meet the boy before he gets too close and welcome him back and protect him from the wrath that will surely await him. If he can reconcile with his son in public, no one will treat his son badly. However, in order to achieve this goal, the father has to humiliate himself in front of everyone. The father sees the son, “while he was yet at a distance” (Luke 15:20) . This distance is much more a spiritual distance than just the physical gap that separates the father and son. The father again breaks the role of a middle aged eastern patriarch and takes his long robes in his hand and runs through the crowded streets out to the edge of the village to meet his pig herder son. 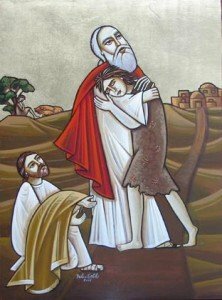 Out of great compassion, he empties himself and becomes a servant and runs to reconcile his son. By the father running, he has greatly humiliated himself. Traditional middle eastern men, wearing long robes, never run in public, because to do so would expose their legs. This was unheard of! Then as the father reaches the prodigal, he falls on his son’ neck and begins to kiss him before he heard his son’s prepared speech. The father didn’t wait for his son’s confession of sin before he showed his love. He offered his grace first! The young man is totally surprised and is only able to get out the first part of his speech. Overcome with emotion as to what has taken place, he can only say, “I’ve sinned and am unworthy to be called your son”, and leaves out the part ,”will you let me work for you as a hired hand”. He changes his mind about trying to work his father’s love and surrenders his plan to save himself. His father has saved him first! If we are to understand the scene in this light, Jesus story has just demonstrated a new definition of repentance. Instead of having to confess, make compensation and demonstrate sincerity to restore the sinner to God’s favor, Jesus is saying, “I’ve been waiting for you and my grace is sufficient to redeem you from your lost condition”. Just as the shepherd goes out to find his lost sheep and the woman diligently searches for her lost coin, the father must go out to find his lost son. The father didn’t just sit in the house and wait to hear what the lost son had to say for himself. He gave himself in costly love by running to him at the edge of the village. The son has a choice to make; he can insist that he will work and pay as a solution to the problem, or he can surrender to grace and accept being found like the sheep and coin. The father, as a symbol for God, quietly evolves into a symbol for Jesus. Jesus, as the Father, at great cost, offers reconciliation to each sinner. The image of God and Jesus as the father in this story shows their compassion, love, and life changing form in a way that no other Biblical literature can match. God is, “Love”, and this parable demonstrates it so wonderfully. Now, to the next act in this beautiful story, the scene of the banquet and the older son. At this point, what is so interesting is that the father in the parable does exactly what Jesus is accused of doing; he receives a sinner and eats with him! In our next lesson we’ll see how the rest of the story plays out!